Here’s a new guest post by author of the soon to be published children’s book. Enjoy! You can also submit your guests post to me by email. Just visit the “Contact me” page on my blog for more details. Where are the real girl’s stories in kids’ books? As a child I can recall reading children’s books about the brave Anne Frank, the bossy Scout in To Kill a Mockingbird, the adventurous Pippi Longstocking and the scheming Katy in What Katy Did, but mostly I had to read about a male hero. Fast forward to today, and there are certain ways in which women are portrayed in the popular media that throw up many challenges for parents bringing up girls. Magazine racks are littered with female celebrities who lurch from one crisis to the next and depicted in popular movies being rescued by men. Unfortunately, a dominant theme in magazines seems to be the need for women to present themselves as sexually desirable in order to attract male attention. Furthermore, the media is sexualising children at a very young age by valuing girls for their appearance rather than their other attributes. This message is seen across toys, clothing and stationary sold for girls. Indeed, I find myself surrounded by books all about naughty boys! Where do you find funny stories about misbehaving girls? As a writer of first fiction for children aged 6 – 8 years old, current popular children book series such as Horrid Henry, Dirty Bertie and Captain Underpants seem to be about (and for) boys. BUT GIRLS WANNA HAVE FUN,TOO! Recent series such as Agatha Parrot, Wilma Tenderfoot, Penny Dreadful and Clementine are full of lively and funny girl characters. But is there a little too much sugar? Spice? All things nice? It seems that in the 21st century girls are not expected to behave truly badly. 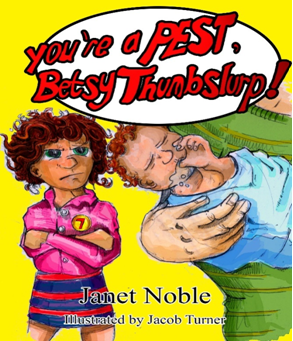 You’re a Pest, Betsy Thumbslurp! E-book will be published at http://www.amazon.co.uk in March 2014. Hi. I’m 49 years young, have 1 husband (so far), 2 cats, 3 children and have spent the last 20 or so years promoting a love of books and reading as a children’s librarian. When I’m not blogging about my favourite children’s books I love to write my own.